What is WP Portfolio Gallery Plugin? WP Portfolio Gallery Plugin is a such type plugin which helps anyone to create a portfolio page into any Blog or Website. A portfolio page will be create automatically. Super easy to use WP Portfolio Gallery Plugin. WP Portfolio Gallery Plugin allows to create unlimited Portfolio Items with Title, Description, Thumbnails, Portfolio URLs. With the plugin installation’s a Custom Post Type named “WP Portfolio" will be created automatically. With the activation a Page will automatically create name “Portfolio". Assign this page to the Appearance>Menu item. You’re done, all the Portfolio items will show here. WP Portfolio Gallery includes- Thumbnails, Portfolio URLs. How This Plugin Looks Like? A Portfolio page will be created automatically and when you insert any portfolio it will be placed into this page. Simply create your own portfolio with this simple WordPress Plugin. 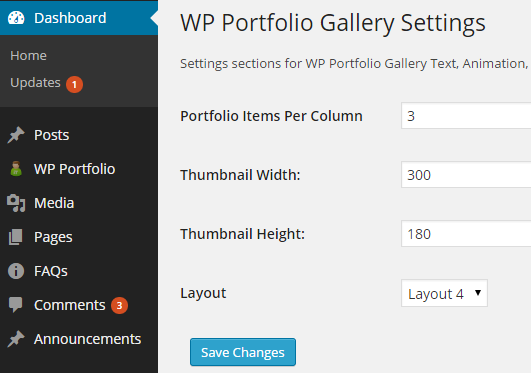 WP Portfolio Gallery Plugin provide a settings panel. You can define your Portfolio column, Thumbnail Width, Height and layout (There are 4 layout, select what you like). We have added a simple portfolio pop up for you. This looks very useful and interesting for showing your portfolio. You will get some social share link also.